One contest chases the other and pool-park riders are unusually busy this summer and every week end brings its new bowl of surprises. On June 25th, Marseilles was hosting the Orange Cup at the famous bowl of Le Prado, then it was Rome with the G-Shock WorldCup; mid-July saw the Mystic Cup in Prague, The Bergfest in Munster, Germany and the Dew Tour just finished yesterday in Ocean City. 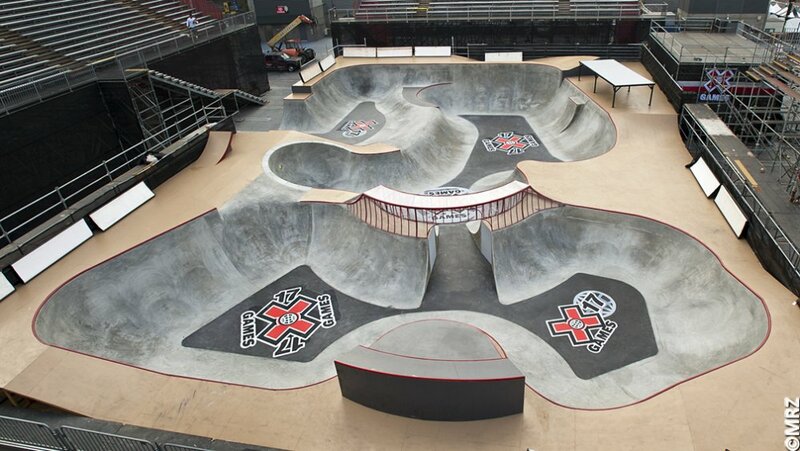 Now enters the X Games which start later this week at Los Angeles’ Staples Center and MRZ from Concrete Disciples has been able to sneak-in the XGames arena to take some pictures of the amazing SuperPark. Just when we thought that the Dew Bowl was the 7th wonder of the skateboarding world, the X Games are stepping up to the plate and going up to the XTra mile with creations that are definitely Xciting and futuristic and above any previous years with designs that implement features from some of today’s top skateparks and many Xtreet elements that seem to be dropped into place from a movie set in Hollywood. Be sure to mark your calendars and set your Tivos.